What was the City of Norwich’s experience with its NYS DEC-sponsored Urban and Community Forestry cost-share grant? We get the scoop from Norwich Planning and Community Development Specialist Todd D. Dreyer and Morrisville State College Assistant Professor Rebecca Hargrave. Dreyer says that the project was done with the cooperation of staff support from the City of Norwich, Cornell Cooperative Extension of Chenango County (for whom Hargrave worked at the time), and the Christian Neighborhood Center. The project included entering the inventory data into a GIS database to enable mapping and computer analysis of the information gathered during the inventory. Headquarters Youth Conservation Corps members (left to right) Katie Rawluk, Kristen Rawluk, Ethan Russell, Ian Weaver, Pat Taylor, Linas Impolis and Conor Tarbell. Not pictured are Zac Calderon and Cheyenne Beach. The NYC-based environmental and urban forestry nonprofit organization, Trees New York, has trained Citizen Pruners since 1976. In light of so many years of success—including mentoring new Citizen Pruner groups upstate—they created the Advanced Citizen Pruner Program in 2012. You can see a video about the Trees New York Citizen Pruner program here. 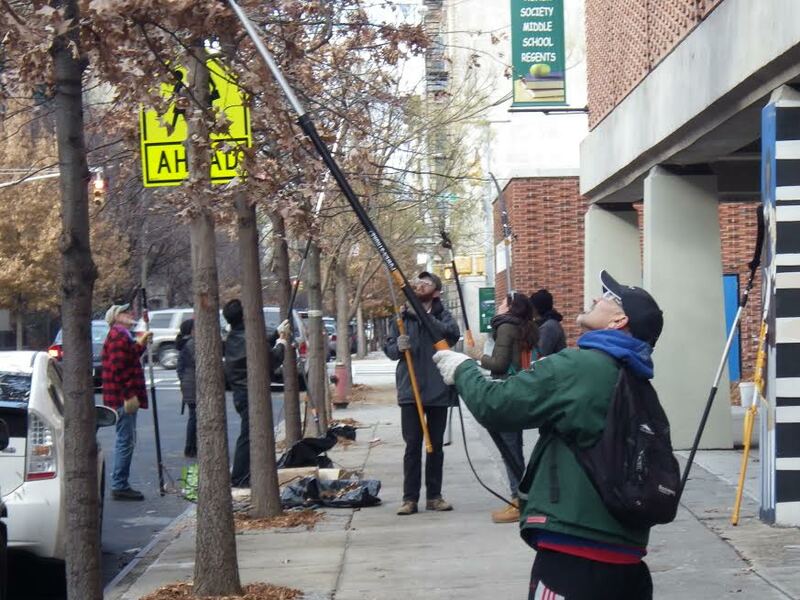 Trees New York applied for and received a NYDEC U&CF Round 11 Cost-Share Grant for its Advanced Citizen Pruner training and work sessions. In-kind support came from NYC Parks in the form of NYC Parks foresters on hand for the training and Park staff and trucks to haul brush away. The training took place in summer of 2012 and the work outings began in November 2012. The focus was on structural pruning of young trees that were out of their two-year warranty, and the majority of the work took place in East Harlem, since it had dense plantings of such young trees. We spoke with Trees New York’s Executive Director Nelson Villarrubia about their Advanced Citizen Pruner Program project implementation and things to consider when applying for a NYDEC U&CF Cost-Share Grant. Following the Q&A is the narrative of the Trees New York successful Round 11 Cost-Share Grant application. This successful narrative is instructive for municipalities who want to apply for the next round of grants (Round 13), the details of which should be announced later this fall. In 2011, the Town of Red Hook Tree Commission successfully applied for a Round 10 NYS DEC Urban and Community Forestry Cost-Share grant that they used for a tree inventory and tree planting. The example provided by the excellent Red Hook Grant NARRATIVE will be of interest to your community as you prepare your cost-share grant applications for Round 13 later this year (stay tuned to NYSDEC’s web page about the grants for the timetable). After the grant monies were put to use in 2011-2013, Red Hook Tree Commission Chair Nancy Guski prepared a final report that follows. Along with the grant narrative linked above, this report is recommended reading for any community thinking about applying for cost-share grants later in 2015. Q: What do you call a highly functioning, well-informed, enthusiastic tree Committee? This amazing group of seven people is “doing it by the book” and more. Led by chairperson Nancy Guski, a retired elementary school teacher, the committee is comprised of a landscape professional, a former planning board member, another retired teacher, two retired dentists, and a nature lover and eagle expert. All participate according to their talents and time but the key is that they ALL participate. Measuring Diameter at Breast Height (DBH) during the in-house, grant-funded inventory. In 2011, the Buffalo Olmsted Parks Conservancy (BOPC) successfully applied for a Round 10 Urban and Community Forestry Cost-Share Grant from NYS DEC. Among other things, the funds went toward updates to the City of Buffalo’s tree inventory, condition assessment of the existing BOPC Tree Inventory and Management Plan, and priority maintenance to trees within the Buffalo Olmsted Park System. The original tree inventory for Buffalo was performed in 2005 and updated in 2008, but by 2011, there was a need to include the 2,100 trees planted in the prior two years and a need to update the conditions report for the 11,500 trees in the database. Elizabeth Murray is a former Village of Scottsville Trustee and a past chairperson of the Village’s Forestry Board, and now serves as the Forestry Board’s clerk. She provided this background narrative about Scottsville’s two successful cost-share grant awards and their implementation. Following that is a quick Q&A with Elizabeth. In late 2009, the Village of Scottsville assembled an ad hoc “Forestry Committee” comprised of several residents, an Eagle Scout candidate, two Village Board trustees, the mayor, a local member of the U.S. Forest Service, and the Village’s Superintendent of Public Works. This committee was formed in response to concern over the village’s aging tree population and tree work recently conducted by a utility company on right-of-way trees. NYS DEC is committed to providing support and assistance to communities in comprehensive planning, management, and education to create healthy urban and community forests and to enhance the quality of life for urban residents through its Cost Share Grant program. The availability of the next round of funds will be announced in late spring 2015, and the due date for applications provided at that time. At least $900,000 in grants will be available to municipalities, public benefit corporations, public authorities, school districts and not-for-profit organizations that have a public ownership interest in the property or are acting on behalf of a public property owner. Communities may request from $2,500 to $50,000, depending on municipal population. Funds are made available from the Environmental Protection Fund and will be managed and allocated by DEC.